STANFORD, CA— Providing new insight into the inner workings of the central nervous system, a study published Friday by researchers at Stanford University revealed that human reaction time is now most accurately measured by the speed at which a person is able to pause a video on ESPN.com. “The data clearly indicates that one’s ability to respond to sensory stimuli is best represented by the number of milliseconds that pass between seeing the video player load at the top of an ESPN article, hovering the cursor over it to reveal the control bar, and then hitting the pause button,” said Stanford neurologist Dana Frankel, adding that upon processing the audiovisual prompt, the brain will immediately begin firing neurons that signal the fingers to stop the video before sounds of a pre-roll commercial begin playing. “We’ve also found that we are able to actually improve upon this reflex over time with practice. 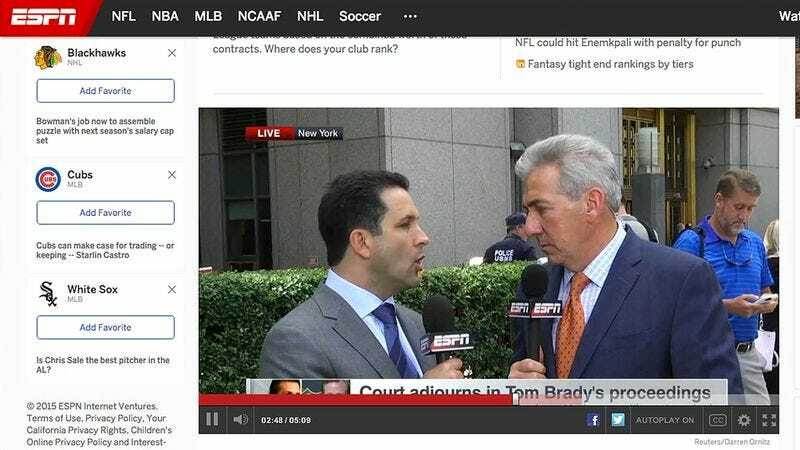 Amazingly, in certain cases, pausing the ESPN video after clicking on an article becomes a borderline involuntary response, much like jerking one’s hand away after touching a hot stove, for instance.” Frankel went on to say that failure to hit the pause button and subsequently allowing the ESPN video to play in its entirety is a clear sign of severe and irreparable brain damage.